Introducing NEW Steripod Kits for Men – Just in time for Father’s Day! This year why not get Dad something he’ll actually use every day to help improve his health, get a closer shave and have better breath? This is no gag gift – in fact Steripod Tongue Cleaners have three scraping services that help fight bad breath and promote a healthy mouth. With its feather light, ergonomic design, there’s no unpleasant gag reflex. 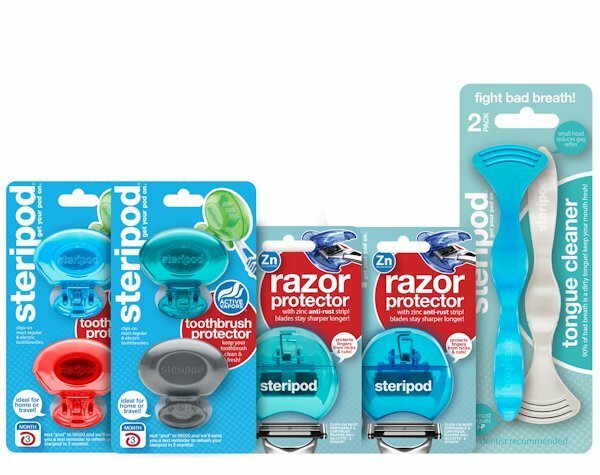 NEW Steripod Razor Protectors use the same science that prevents rust on boats and skyscrapers for sharp blades plus protection from unwanted nicks, cuts and dust. Just clip Steripod on to any manual or electric toothbrush to create a protective ‘pod’ which surrounds the brush head and helps shield it from both airborne, environmental and cross contamination – no batteries or cables required. Now available in more than 20 easy-to-color-code options, including new colors designed for maximum Dad-appeal — like Black Pearl, Silver, Teal and Crystal Clear Purple — Steripod keeps your toothbrush clean and safe for up to three months using thymol vapors to protectively encircle the toothbrush bristles. Steripod items are a must at home to protect from airborne contaminants and cross contamination. Steripod is also IDEAL to protect Dad’s razor and toothbrush on-the-go — from family vacations and business trips to inside his gym bag. NEW Steripod Kits for Men are now available on Amazon and GetSteripod.com for $19.99.